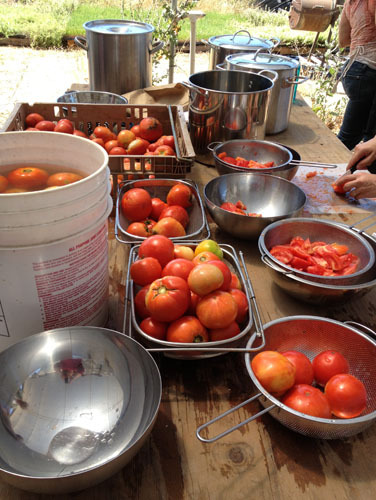 Once a year we go out to the farm that does our CSA box -- Eatwell Farm -- and participate in a massive tomato sauce party. They have several of these every year, most recently adding some in San Francisco for those who are to weak to handle Dixon weather. And that weather is formidable. Last year, temperatures went up to 105F the day of the party and we all almost died. We ended up not cooking the sauce down very much at all, and what we canned had to be cooked down another 50% to be real sauce. So this year I came up with a new plan. 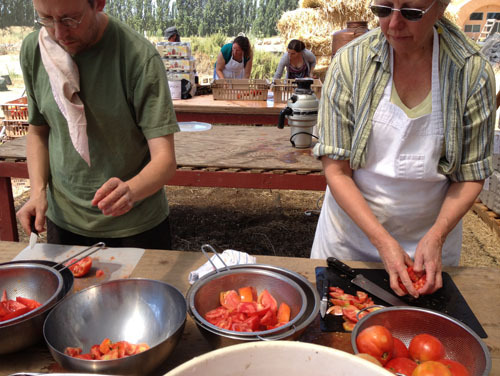 The plan was that we arrive at the farm and set up a line to process tomatoes: I wash them, and Noel and our friend Victoria would chop. 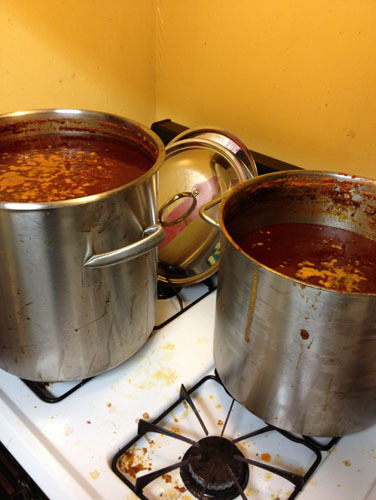 We brought four large pots (three five gallon stockpots, one six gallon stockpot), and we filled one with onions and basil, and the others with chopped tomatoes. We would then not set up the burner and sit around dying from the heat, but go home and cook the sauce there. This turned out to be an excellent plan on many levels. So there's our assembly line: on the left you see my bucket with tomatoes to wash -- many of them were well coated with mud, so this was a necessary step. I took them from the big brown flat, soaked them in the bucket, gave them a thorough rinse, then set them in the colanders. On the right Noel and Victoria had cutting boards set up to chop tomatoes, which were dumped into the pots as their bowls filled up. We also had a compost bowl, which I regularly emptied. We were pretty efficient. 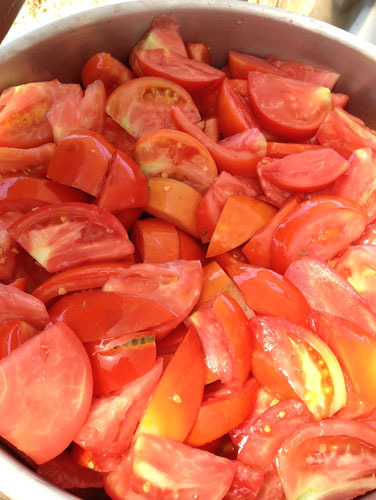 I think with another person chopping they could have kept me busy just washing tomatoes. I refrained from chopping because I'm taking an anti-coagulant right now, and knives are a bad idea. 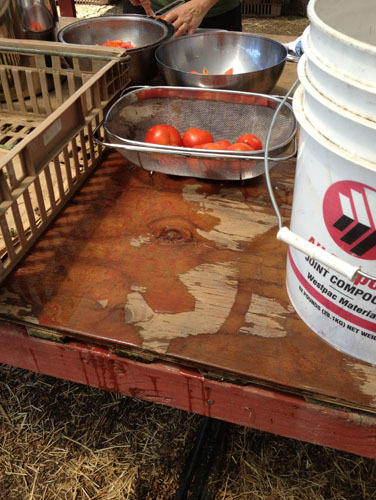 The table had a slight tilt to it, so the juice from all those tomatoes was running off right onto me. 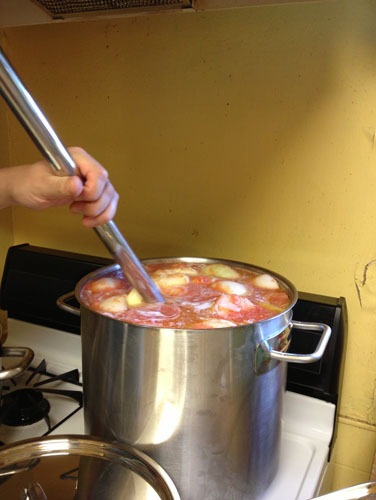 We thought it might only take a couple hours for us to process our sixteen gallons worth of tomatoes (the fourth pot was allotted to onions and so forth, also supplied by the farm), and it took about two hours. Just as it was starting to get too hot for us to handle out on the farm, we loaded up the car and headed back to the fog to do the hot work where it is a lot cooler. Once at home, and after having a very nice lunch of gazpacho and grilled cheese sandwiches, we set up a series of assembly lines under the careful supervision of Mr Kitty. I cleaned and weighed onions, Victoria carefully curated the basil. Noel was doing food mill work: we put smaller pots of chopped tomatoes on the stove to soften, then he put them through the mill. The resulting sauce was weighed and dumped into a big pot. We used recipes from Marcella Hazan, because she knows what she is talking about with sauces. 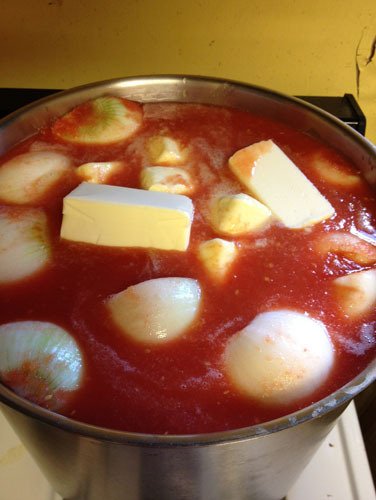 The first pot was about 31 lbs of tomato sauce, to which we added somewhere over 6 lbs of onions cut in half or quarters (depending on the size) and 10 (yes, TEN) sticks of butter. Noel had to make a run to the store to get more butter. The recipe actually called for more onions but we literally could not fit them in the pot. As it was, using the big paddle to stir the sauce was perilous for the first few hours. While this was coming up to full heat, with those sticks of butter floating in it, I just found this sauce fascinating. It also smells like heaven. 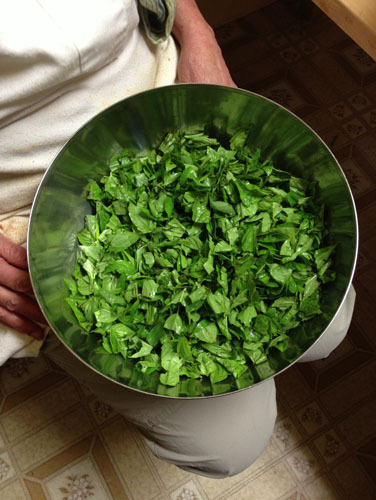 Our work went well into the evening, so we paused in the middle of pot number two to have some nice fresh homemade pesto. Another Marcella Hazan recipe. We froze half of it to enjoy later. I love spontaneous little sauces like that. 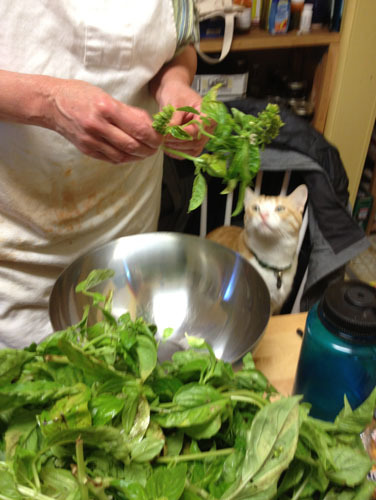 On a basil theme, sometime after dinner Victoria finally was able to finish her carefully curated and hand-ripped basil. 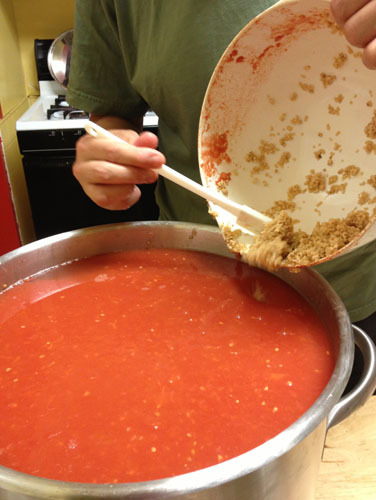 We set it aside to add to the sauce during canning: we'll drop a bit in every jar to ensure every one gets enough. 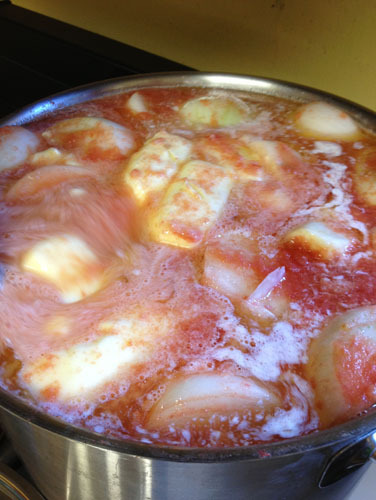 The second pot is Marcella's garlic basil tomato sauce. 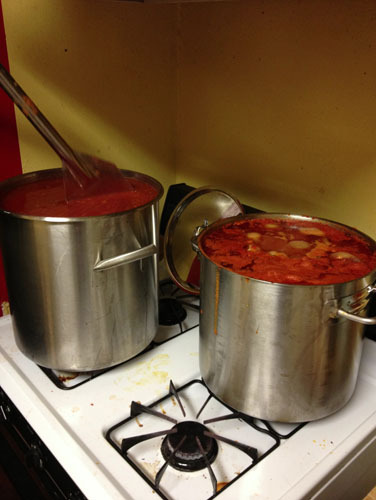 We ended up with 48 lbs of tomato sauce, plus 8 cups of chopped garlic and 8 cups of olive oil. The recipe calls for adding the basil (about 8 cups) to the sauce at the very end, and that was why we decided to add it at the canning time. We could only fit four cups of olive oil in the sauce to start (we added the next four yesterday). I still find adding that much of anything to a recipe entrancing. 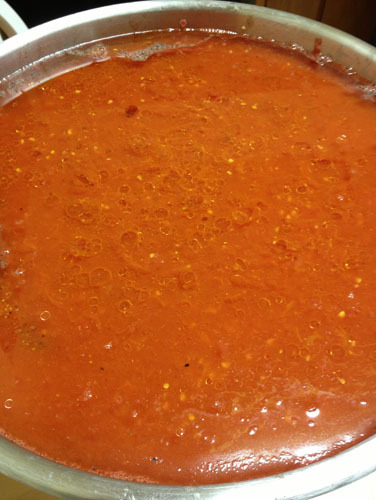 Over time the oil will get incorporated into the sauce, as water gets boiled off. Then we set both pots to cook down overnight. On Sunday afternoon they were still going. Noel fished the remains of the onions out of the first pot, and we gave them both a taste. Then they just stayed on the stove, burbling away. The whole house REEKS of tomato sauce. The onion/butter sauce is going to be done today. 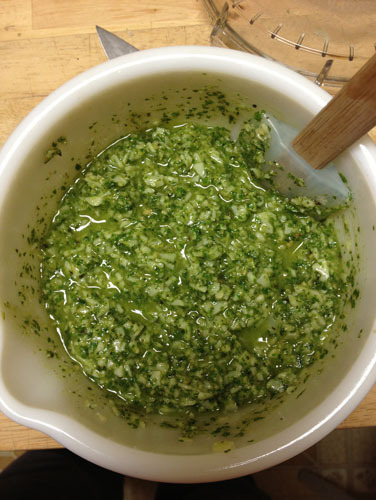 The garlic/basil sauce is taking longer -- the larger pot means less surface area to cook off through. Once we share the proceeds with Victoria this will be quite the sauce haul. And nobody has heat exhaustion or that horrible hung-over feeling from too much time in the sun. Plus the sauce gets longer to cook down and be a real sauce. We think this method is a win. I'd love to see how you can it all up! Wow. The sauce looks great. I can empathise with the work load. I processed 13lbs. Of tomatoes into sauce yesterday. Wow...that is a lot of work but does taste great!